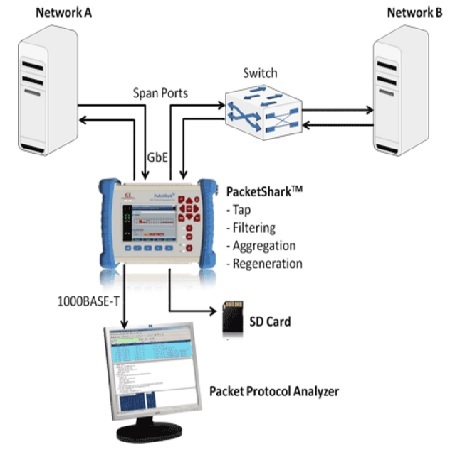 GL's PacketShark™ is a portable product that can tap packet networks, capture Ethernet packets at wire speed, i.e., in optical or electrical interfaces up to 1 Gb/s and selectively filter the captured traffic based on specified criteria. Packets are transmitted through two ports and the packets that are traffic compliant with one of the filters is sent to a packet analyzer, such as Wireshark® or GL's PacketScan™ for detail packet analysis. Alternatively, the traffic can be even sent to a memory card (SD) and later analyzed offline. PacketShark™ is an invaluable tool for on-field simultaneous capturing from two interfaces, analyzing 100% streams without any delays, and filtering/aggregating required packet streams at wire speed.PacketShark™ overcomes most of the limtations of the protocol analyzers running on Laptops or PCs that are too slow to capture live Full Duplex traffic at wire speed. It is generally preferred over "mirror" ports and traditional taps in providing aggregated traffic output and mobility. It supports all the features of high-end taps in a small, battery operated instrument, weighing less than 1.2kg, and providing mobility and storage capacity to reach any point in the network. It provides INSTANT ON features - no PC required.